A new study by the National Science Foundation shows that more than 40% of Americans think that astrology is a science, the highest levels since 1983. The NSF uses the question about astrology as a science as both an indicator of scientific understanding among the public and as a way of measuring "the public's capacity to distinguish science from pseudoscience." In 2012, America did not do so well on this test, with just over half (only 55%) of Americans correctly identifying astrology as not a science. 32% thought it was "sort of scientific" and 10% called it "very scientific." Over at Mother Jones, Chris Mooney has graphed out the results of the study by age. The biggest age group to believe in astrology this year are the 18-24 year olds, just like it has been in every previous year. But, though the 18-24 year olds formed the biggest group, the biggest jump in belief in astrology from the last time this study was done in 2010 actually came from the 35-44 year olds. The news isn't all bad, however. In the same study, 80% of Americans also said they'd like to learn more about new scientific and technological discoveries (presumably not including astrology). So, what do you think? 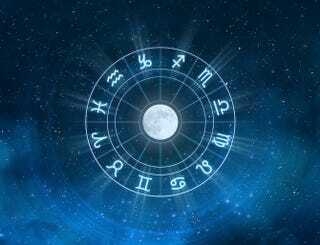 Have you seen a rise in belief in astrology? Give us your take in the comments now.